Here we are, in the throws of football season. Each year the couch or bar stool claims several hours of our lives for weeks at a time, fans cheering and moaning as their favorite teams play for that coveted Super Bowl spot. We are excited that the Seahawks are in the running again and are already gearing up for the party. Even though I’m not a huge fan of football, what I do love are the game day traditions and food. Last year I was asked to take part in a recipe development contest. I’ve never been in this sort of head to head recipe contest before so I have to admit, I’m a bit nervous! I also have no idea what the others created, but if you know me, you’ll know that garlic and bacon are two of my most favorite ingredients in the world! I’ve also been a bit obsessed with trying my hand at monkey or pull apart bread recipe so I decided to mash everything together into a bite sized nom. I can tell you that these puppies went fast during my recipe taste and test runs. They are best served warm so if you’re taking them to a party, go ahead and pre make them to the finish point and then simply reheat for a few minutes in the oven right before serving. These are perfect for lazy Sunday mornings or to bring to any potluck dinner. Also read: 5 of the Most Adorable Halloween Bento Box Ideas Ever! Carefully open can of biscuit dough. It should be pre-sliced into 8 pieces for you. Take one pre-cut biscuit and flatten in palm of hand. 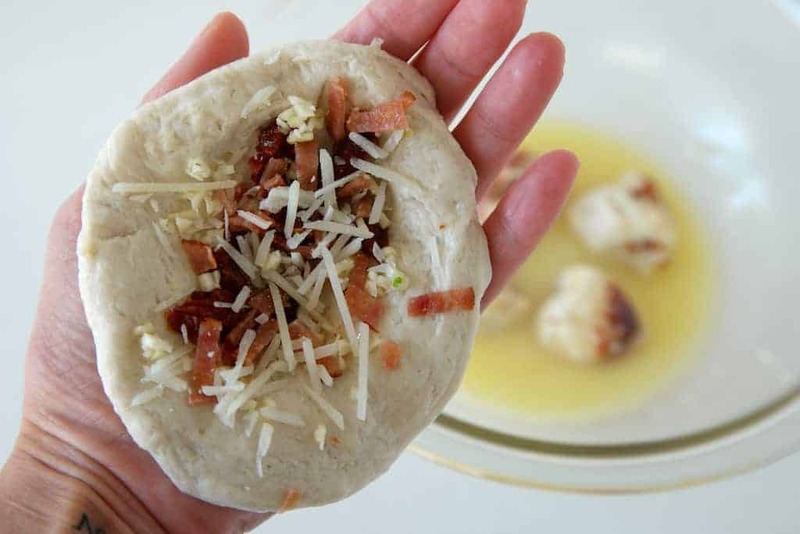 Place pinch of bacon, sun dried tomato and reserved parmesan cheese into center and then knead and roll into a ball. Repeat until all 8 are formed. Cut each ball into quarters. Dredge one quarter piece in the butter/parmesan mixture and then place into lined (these are the silicone muffin liners I use!) 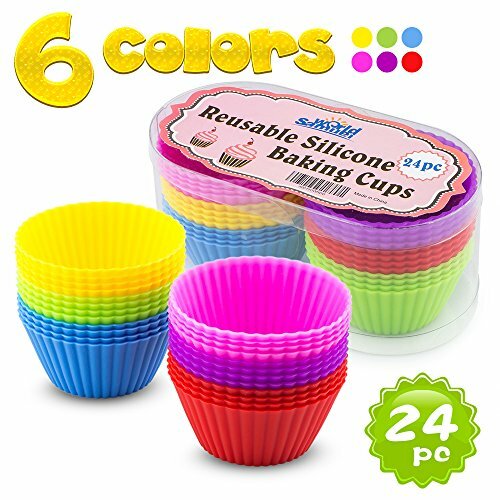 or sprayed muffin tin cup. Sprinkle with mozzarella. 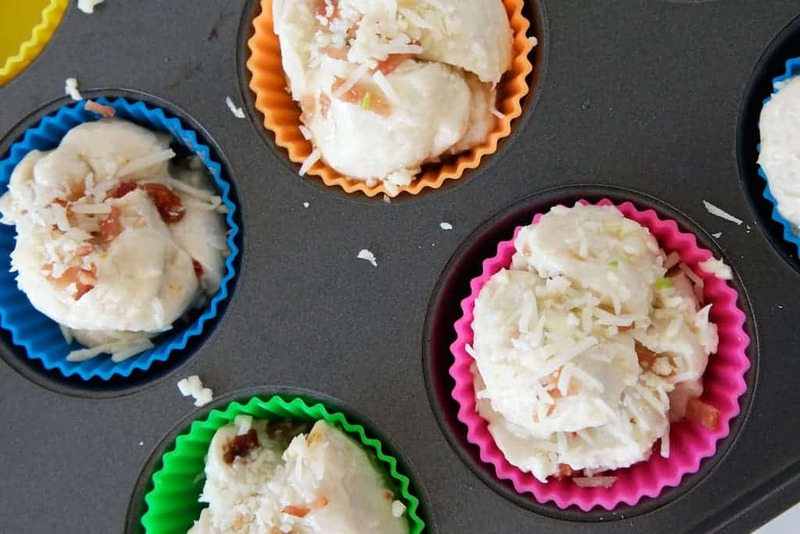 Repeat 3 more times until you have all 4 pieces pushed into ONE muffin cup, with mozzarella sprinkled IN BETWEEN each. Sprinkle more mozzarella on top. Repeat until all 8 muffin cups are full. Bake at 350 degrees for 17-20 minutes, or until tops are golden brown or desired doneness. Sprinkle with basil and allow to cool for a few minutes before serving. This Cheesy Garlic and Bacon Mini Pull Apart Bread Recipe will be your new favorite Game Day appetizer. They are also perfect for lazy Sunday mornings. Cut each ball into quarters. Dredge one quarter piece in the butter/parmesan mixture and then place into lined or sprayed muffin tin cup. Sprinkle with mozzarella. 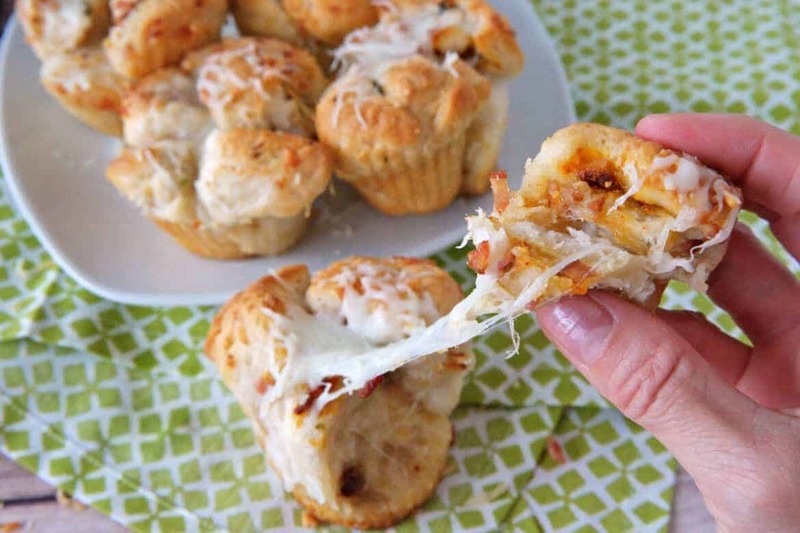 Repeat 3 more times until you have all 4 pieces pushed into ONE muffin cup, with mozzarella sprinkled IN BETWEEN each. Sprinkle more mozzarella on top. Repeat until all 8 muffin cups are full. These are best served warm, but can made ahead of time and then warmed right before serving to save time. They also freeze well, but I'd be really surprised if you have any left over to freeze! Im definitely going to try out this recipe. Looks so good!!! Pretty much anything with bacon in it is amazing. Then add cheese into the mix and I’m sold. That looks like a super yummy recipe! I’ll have to give this a try! 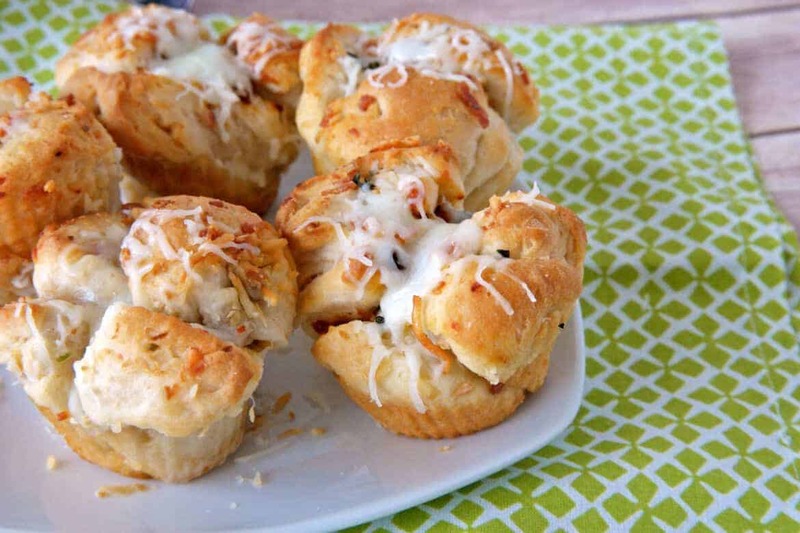 I have to admit this game day Mini Cheese Garlic and Bacon Pull Apart Bread sounds so delicious. This would make a great snack for any time or occasion. Thanks for sharing the recipe. There is something about garlic and cheese and bread that make it so amazing. This having bacon just makes it even more amazing!